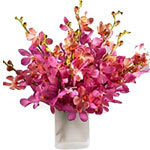 Product description: Orchids are exotic and when they come in pink they ooze royalty! 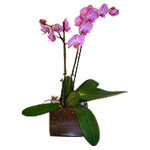 Gift a bunch of 10 pretty orchids stems to your orchid-lady! Vase not include. 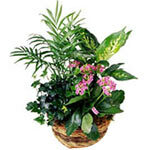 Dare to be different and stand out from the crowd, with our exotic selection of mix flowers.something very different for a very special someone. 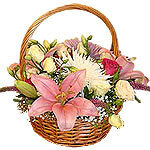 It is a lovely gift to send to any flower lover. The bear will remind her of you forever! 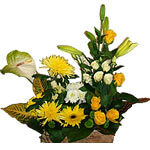 This forever arrangement are made of mixed red flowers and lovely teddy.